1938 For the first time, a group of movie stars organized a committee, the Motion Picture Democratic Committee, to support a political party. 1938 During the filming of The Wizard of Oz (1939), Buddy Ebsen (as the Tin Woodsman character) was hospitalized due to an allergic reaction to the aluminum dust required for his costume. He was replaced by Jack Haley for the immortal role. 1938 Producer Jed Buell's B-western/musical The Terror of Tiny Town (1938) (with the tagline: "Little Guys with Big Guns") was the first film with an "all-midget" cast, portraying cowboys and cowgirls. The amusing "novelty" cult film flopped miserably, and has been rated as one of the worst films ever made. 1938 African-American leaders publically called on the Hays Office to make roles other than doormen, maids, and porters available to blacks. 1938 The first appearance of an early prototype of Bugs Bunny, possibly the greatest cartoon character of all-time, was as Porky Pig's antagonist in Warners' Porky's Hare Hunt (1938). He would appear fully-developed and in his first starring role in Tex Avery's Oscar-nominated A Wild Hare (1940). 1938 Action Comics No. 1 was published in June of 1938, marking the debut of the comic book character Superman. Superman's first film appearance came a few years later - he debuted in an animated series of seventeen Superman cartoons, beginning with Fleischer Studios' creations from 1941-1942, in an agreement with DC Comics. Dave and Max Fleischer were responsible for the first nine Superman cartoons (the pilot and eight subsequent shorts). 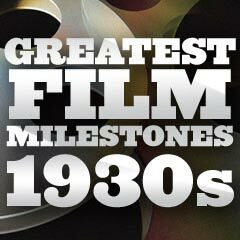 1938 All the major movie studios (the Big Five) were sued in 1938 by the U.S. Department of Justice in the government's anti-trust lawsuit against unfair trade practices, claiming that the studios monopolized both the production and distribution of motion pictures. Eventually, the case reached the US Supreme Court 10 years later, in a decision against the movie studios. 1938 Versatile director Howard Hawks' greatest screwball comedy, Bringing Up Baby (1938), opened - it has often been considered the definitive screwball film and one of the funniest, wackiest and most inspired films of all time. However, at the time of its release, it failed miserably at the box-office after two weeks in the theaters, and was soon forgotten, until it was revived years later. The film was Katharine Hepburn's only screwball comedy role, and her final film for RKO, since she had been infamously labeled 'box-office poison' through most of the 1930s. 1938 The first and only on-screen kiss between the memorable dancing-singing partnership of Fred Astaire and Ginger Rogers was in their 8th RKO film, Carefree (1938). 1938 Director and narrator Orson Welles' 60 minute adaptation of the H.G. Wells' novel The War of the Worlds was broadcast on the CBS Radio Network on October 30, 1938. The show was performed for Welles' radio drama anthology series Mercury Theatre on the Air. Its airing caused panic in various parts of the US when listeners believed a real Martian alien invasion was occurring. The event also brought Orson Welles publicity and notoriety, allowing him to become a film-maker with his first feature film, Citizen Kane (1941). 1938 Roy Rogers made his starring film debut in the Republic Studios' B-western Under Western Stars (1938), after which he became popularly known as the "King of the Cowboys" replacing Gene Autry. Singing cowboy Roy's song in the film, Dust, was nominated as Best Original Song (written by Johnny Marvin), but the Academy Award went to Thanks for the Memory in The Big Broadcast of 1938 (1938). 1938 A series of 28 films over a period of 12 years, based on Chic Young's popular comic strip Blondie, made its debut with the first film Blondie (1938). The situation-comedy films starred Penny Singleton as Blondie Bumstead and Arthur Lake as bumbling husband Dagwood, plus their five year-old son Alexander (aka Baby Dumpling) (Larry Simms). The last film in the series was Blondie's Hero (1950). The three major directors of the films included Frank Strayer, Abby Berlin, and Edward Bernds. 1938 Russian director Sergei Eisenstein directed the epic film Alexander Nevsky (aka Aleksandr Nevskiy, Russ. ), a nationalistic film that presented the medieval story of the 13th century Russian prince Alexander Nevsky (Nikolai Cherkasov) -- enhanced with a score by Sergei Prokofiev. The film's most memorable battle scene was on the ice (that started to crack) at frozen Lake Peipus in 1242 between the invading barbaric Teutonic knights and the Russian army - both wielding spears and axes. 1938 The California Child Actor's Bill, better known as the Coogan Law was enacted. The child labor reform act took place after 23 year old Jackie Coogan, who had starred in The Kid (1921) opposite Charlie Chaplin, sued his parents (mother and stepfather) for mismanaging and exploiting his career and spending his acquired fortune as a young star. To protect the earnings of child actors, it required that fifteen percent of a child's earnings be set aside in a trust that could not be tapped without a court order until the child came of age. Various child labor laws and other similar acts have since been established. Later, Coogan became known for playing Uncle Fester on The Addams Family television show. 1938 MGM loaned actor Clark Gable to David O. Selznick for his production of Gone With the Wind (1939) for his most famous role as Rhett Butler, in exchange for the film's distribution rights and one-half of the profits (further reduced by Loew's Inc.'s 15% interest and a requirement to pay Gable's $4,500 per week salary and one-third of Gable's $50,000 loan-out bonus). 1938 Innovative and pioneering French filmmaker Georges Melies died at the age of 76 in Paris, France. He was noted for the use of magical special effects in his early films, including the stop-trick (or substitution) effect used to make things seemingly disappear. His most famous film was Le Voyage Dans La Lune (1902) (aka A Trip to the Moon). 1938-1939 Spencer Tracy won his second Best Actor Oscar in early 1939. He had won the 1937 Oscar for his role as Portuguese fisherman Manuel in Captains Courageous and then this 1938 award for Boys Town. This was the first time that an actor had won the Oscar in consecutive years.